An animated comedy series about movie nerds. The Lyric (Fort Collins, CO), February 9–22, 2018. World premiere and debut theatrical run. Door County Short Film Festival (Sister Bay, WI), February 16–17, 2018. Finalist. GeekFest Year Five: Long Beach Comic Expo (Long Beach, CA), February 17–18, 2018. Winner: Best Web Series (for Multiplex 10: The Web Series). GeekFest Year Five: Comic Con Revolution (Ontario, CA), May 19–20, 2018. Official Selection. Mindfield Film Festival – Albuquerque (online film festival), February 2018. Winner: Diamond Award (Best Animation Short). Direct Short Online Film Festival (online film festival), March 2018. Official Selection. Stareable (online web series hub), March 26, 2018. Daily Pick/Staff Pick (for Multiplex 10: The Web Series). Mindfield Film Festival – Los Angeles (online film festival), April 2018. Official Selection. Winner: Gold Award (Best Animation). Berlin Flash Film Festival (Berlin, Germany/online festival), May 2018. May 2018 Winner: Super Short Animation/Stop Motion (for “Self-Help”). 2018 Finalist. Bad Film Fest (Brooklyn, NY), June 8–10, 2018. Official Selection. Small Wonders: An Exhibition of Tiny Art & Films (Detroit, MI), July 14, 2018. Official Selection (for “Self-Help”). The Independent Cinema Showcase, Summer 2018 (Los Angeles, CA), July 29, 2018. Official Selection. Monmouth Film Festival (Red Bank, NJ), August 10–12, 2018. Winner: Best Web Series (for Multiplex 10: The Web Series). 9th Annual We Like ’Em Short Comedy and Animation Festival (Baker City, OR), August 16–19, 2018. Official Selection. International Academy of Web Television (IAWTV) Awards (Los Angeles, CA), August 24, 2018. Finalist, Best Animated Series (for Multiplex 10: The Web Series). GeekFest Year Five: Comic Con Palm Springs (Palm Springs, CA), August 24–26, 2018. Official Selection. Palm Springs International Animation Festival (Palm Springs, CA), August 22–26, 2018. Official Selection, 2D Comedy Shorts category. GeekFest Year Five: Long Beach Comic Con (Long Beach, CA), September 8–9, 2018. Winner: Best Web Series (for Multiplex 10: The Web Series). FilmQuest Festival (Provo, UT), September 7–15, 2018. Official Selection, Web Series (for Multiplex 10: The Web Series). GeekFest Year Five: HawaiiCon (Waimea, HI), September 13–16, 2018. Winner: Best Web Series (for Multiplex 10: The Web Series). Minnesota WebFest (Minneapolis, MN), September 28–29, 2018. Winner: Best Animation/Puppetry (for Multiplex 10: The Web Series). FirstGlance Film Festivals – Philadelphia (Philadelphia, PA), October 12–14, 2018. Official Selection (for Multiplex 10: The Web Series). Nominated for Best Director – Web Series (Gordon McAlpin), Best Comedy, Best Actor – Web Series (Tom Brazelton), Best Actress – Web Series (Dana Luery Shaw), Best Ensemble Cast – Web Series, and Best Sound Design. Satisfied Eye International Film Festival (Epsom, Surrey, UK), October 26, 2018. Official Selection. GeekFest Year Five: Stan Lee’s Los Angeles Comic Con (Long Beach, CA), October 26-28, 2018. Official Selection. GeekFest Year Five: Rhode Island Comic Con (Providence, RI), November 2–4, 2018. Winner: Best Web Series (for Multiplex 10: The Web Series). Freedom Shorts XVIII (Philadelphia, PA), November 8, 2018. Official Selection. South Carolina Underground Film Festival (Charleson, SC), November 9–11, 2018. Official Selection. Kinofilm Manchester International Short Film & Animation Festival (Hulme, Manchester, UK), November 26–December 2, 2018. Official Selection. Canada Shorts Film Festival (Saint John, New Brunswick, Canada). December 2018. Official Selection. Winner: Award of Excellence. Love Your Shorts Film Festival (Sanford, FL). February 7, 2019. Official Selection. 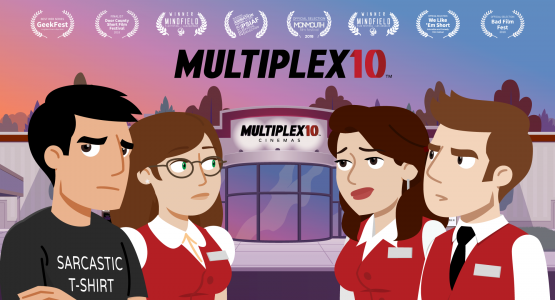 Would you like to screen the Multiplex 10 short at your theater or festival? © 2018 Chase Sequence LLC. All rights reserved.